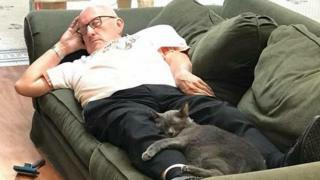 Photographs of a Wisconsin retiree cat-napping with his feline friends have gone viral – melting hearts online and leaving the shelter inundated with well-wishes and $40,000 (£30,000) in donations. Terry Laurmen, 75, has become a regular volunteer at the Safe Haven Pet Sanctuary in Green Bay over the last year. Set up like a cat cafe – with sprawling arm chairs and the bird channel on loop on television – the shelter was set up by 27-year-old Elizabeth Feldhausen in 2016. It specialises in looking after, rehabilitating and rehoming cats with disabilities and special care needs who would be at risk of being put down elsewhere. Terry, a retired Spanish teacher, began turning up almost every day with his own special brush to groom the cats. As a cat-lover who travels for large chunks of the year, he is unable to get one of his own, but has always loved volunteering with them. “They all know him, when he walks through the door they run over to him because they know he has the special brush and the special treats. They all pile on top of him and rub all over him and just love him,” sanctuary owner Elizabeth told the BBC. But grooming 20-30 cats can get exhausting, and the other volunteers began snapping shots of Terry taking his daily siestas with his furry friends. Those images, of Terry and the cats curled up on the sofas together, were posted on Facebook a few days ago and have now been shared across the world more than 22,000 times. The shelter has taken to dubbing the loyal volunteer “Cat Grandpa” – a name he approves of – but neither can quite get over his new-found online fame. “I knew people in our community would like it but I didn’t know how far it would go,” Elizabeth says. Since their post went viral, the shelter has been inundated with locals popping in to visit the cats and possibly grab a glimpse of Terry too. Thousands of well-wishers have shared comments on their social media accounts and pledged thousands of dollars to the shelter in donations. Elizabeth says the money will be used to upgrade their old and draughty building, making it more insulated for the cats and adding more quarantine rooms so they can take even more vulnerable cats in. Terry does not own a computer or a mobile phone so apparently can’t quite understand get his head around his online popularity and describes it as the “craziest thing in the world”. “I fall asleep a lot but I never thought this was going to happen!” he joked on their Facebook page. The viral star has taken the weekend off from his cat-napping to go home to visit his family. So what next for the internet celebrity? “People have been requesting we make a calendar with Terry and the cats on it!” Elizabeth says.